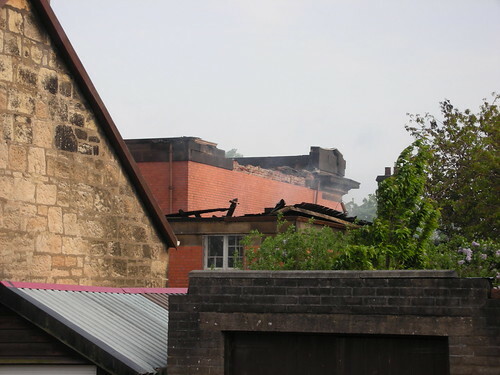 A community hall in the east end of Glasgow has been badly damaged by fire. Crews were called to the blaze at Shettleston Hall community centre in Wellshot Road at 0425 BST on Friday. Firefighters have brought the situation under control but there has been significant damage to the building, which resulted in the roof collapsing. Occupants of nearby homes, who had been evacuated as a precautionary measure, have now been allowed to return to their homes. No-one was injured. At the height of the incident, 30 firefighters were on the scene, amid fears the flames could spread to nearby buildings. Crews are expected to remain on the scene for the remainder of the day. Strathclyde Fire and Rescue said an investigation with Strathclyde Police was now underway into the cause of the blaze. Officers from Glasgow City Council will inspect the damage to the building. 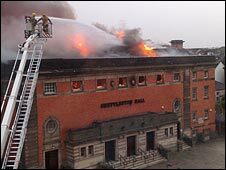 Shettleston halls were set aflame this morning which will be an inconvenience for people who have booked it for a wedding. Hundreds of parents will have nowhere to take their leotard clad weans tomorrow and the next sitting of the licensing court will have to take place elsewhere. I think the place was being done up. More in the Evening Times and the Herald. 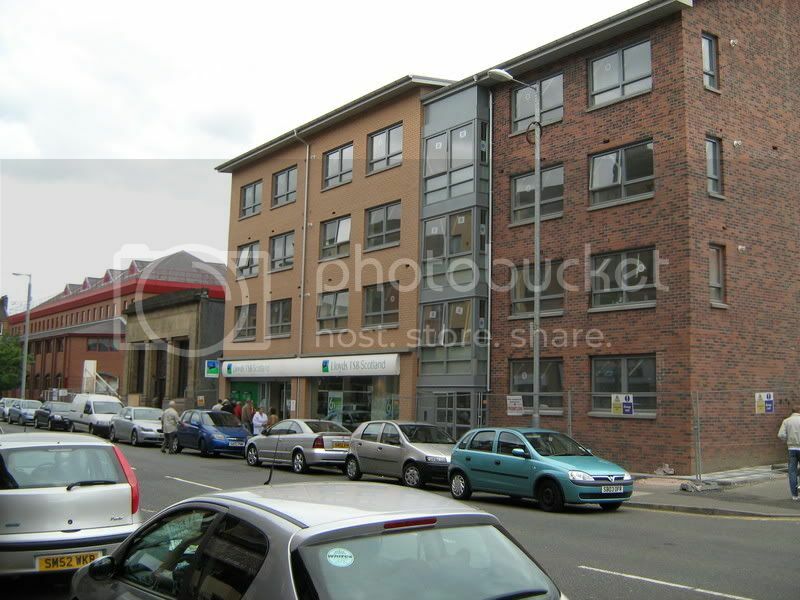 The Shettleston Halls are pretty massive - theatre, upper hall, offices and other rooms. And really well used by the local communities too, not quite the centre of them, but given the investment it no doubt would be! Here's hoping the uncertainty surrounding LES and LLP's doesn't get in the way of saving and restoring this building! Hmm, perhaps should we all go down and link arms? I drove past it an hour ago (I didn't have my camera on me), and it's in a really bad way. There's some fencing been erected around it and a fire engine was still sitting outside. You can see right inside the building from the left hand side, and there's only a few beams left of the roof. Like the building itself, I am gutted. just as glasgow city council annouced cutbacks of 50 million too, who'd have thought this facility would have burned to the ground and saved them the cost of running it, Im sure they'll go all out to replace it. crusty_bint wrote: It has been demolished. What? Shettleston or the Halls? Hawl you! 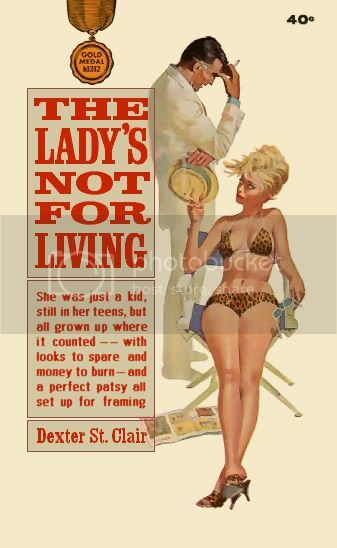 I hope you're not disparaging my home turf? 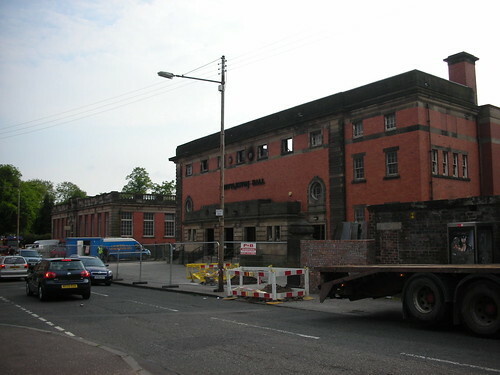 But now that you ask, I suppose Shettleston is being demolished - the old (very fine!) TSB on Shettleston Rd has also been demolished these last few weeks for the poxiest looking housing I've seen in a long time. If it had been anywhere else in the city (well, central, south or west) there would have been a campaign for retention and reuse. I hate this city at times.